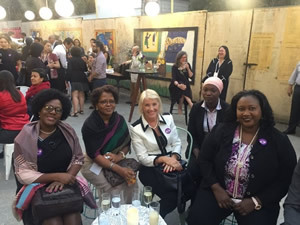 This post was written by WGEA Director Libby Lyons, discussing her recent travels and the state of workplace gender equality internationally. It is going to be a big week in Sydney, with hundreds of community, political and business leaders in town for the Global Summit of Women. There will be lively discussions about the shared challenge of gender inequality and how we make progress on equal pay and workforce participation. Over the last few months, I have been very fortunate to discuss these shared barriers and potential solutions in a number of different countries. Last month, I was in New York for the United Nations (UN) Committee on the Status of Women where I presented the findings from our recent Women in Leadership research, with McKinsey& Company, the Business Council of Australia and BHP. I also visited Vietnam to help the Department of Foreign Affairs and Trade (DFAT) with the work they are doing to promote gender equality in the region. 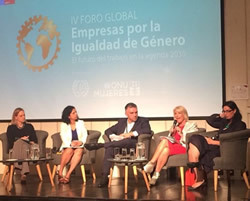 Prior to that, I was in Chile speaking at the 4th Global Forum on Business for Gender Equality held by the UN, the International Labour Organisation (ILO) and the Chilean Government. From Sydney to Santiago, closing the gender gap at work is a growing priority for policy makers. This trend is reflected in some recent interesting developments, including the UK’s new mandatory gender pay gap reporting or Germany’s pay transparency legislation. Sitting among these new international policies, Australia’s gender reporting scheme is well established. And it has a lot offer to this global conversation. Our scheme has created one of the world’s most comprehensive datasets on the state of workplace gender equality. As far as we know, we are the only country in the world to be collecting the breadth and depth of data on gender equality. This broad-ranging data paints a detailed picture of the true state-of-play for women and men at work, generating extensive interest from people all over the world wanting to learn more about our reporting scheme. 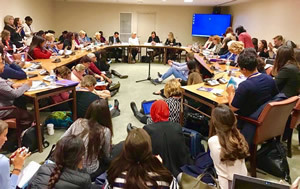 During our presentation in New York, people vied for places in an overflowing room to hear about our research and how BHP are making practical and sustainable changes to reach gender balance by 2025. In Chile, I met with the outgoing and incoming Chilean Minister for Women and the Minister for the Economy, along with representatives from Colombia and Ghana to discuss at length our approach to improving workplace gender equality and the insights that can be drawn from our data. These conversations were also a great opportunity to learn from other nations about the problems they are facing and the solutions they are implementing. I learnt that the gender pay gap knows no cultural or territorial boundaries. Women across the world are being paid less than men and too many women are retiring into poverty. Despite the universal nature of the gender pay gap, I also learnt that we need to be careful not to get bogged down in the minutiae of measures and comparisons. International gender pay gap comparisons are fraught with limitations and often provide an incomplete picture of the state of gender equality in countries. Of course, gender pay gaps are important to this global discussion but we must remember they are a symptom of much deeper and complex problems. Yes, we need to measure progress and keep a close eye on the data, but we also need to look at that much bigger social equation of how we live and work: Who is looking after the baby or grandma? Are men supported to work flexibly and take parental leave? Are our girls feeling comfortable to take up trades and our boys to embrace caring roles? It is only through grappling with these questions that we will really see the data move. While gender inequality at work is ubiquitous, my time abroad taught me that Australia’s experience in addressing it is unique. We are leading the way internationally with our holistic approach to measuring and monitoring organisational progress through data-driven information, education and research. This is something that makes me extremely proud. It also sparks a fire in my belly to do whatever I can to ensure our reporting scheme translates into meaningful change for women and men at work.